The Northern Lights Granulosa (Acropora granulosa) is one of my all-time favorite SPS (small polyped stony) corals. 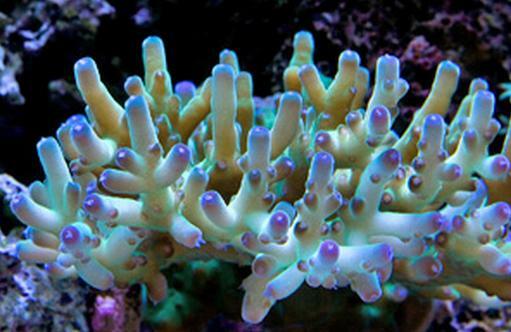 Its radiant color spectrum includes teals, greens, purples, blues, and aquas making it a sure jaw dropper in any reef. Often hard to come by, the Northern Lights Granulosa is the talk of many reefers that have been on waiting lists for months. The addition of a Granulosa to a collector’s tank, is certain to create a buzz in the forums and add more names to our LFS’s wait lists. The Northern Lights Granulosa is relatively easy to care for if given the right conditions. They need excellent lighting from metal halides,and should be placed somewhere bettween the middle and top of the reef. High water flow is a must, as is ideal parameters. As with most SPS species the Northern Lights Granulosa has a low tolerance for poor water conditions. Vivid Aquariums currently has 3/4″ – 1″ frags of Northern Lights Granulosa in stock and going for at the modest rate of $58.99.